There are several different styles /colorways but this is the first one I've seen faked, though I'm sure there will be more to come. At first glance they appear to be quite similar, but there are several differences in the way they are constructed. 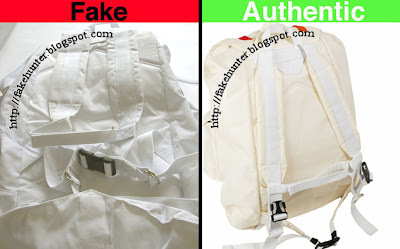 And of course, as always, the quality of the fake's stitching and seams is inferior. Note the sloppy edges of the colored straps. Lastly, and probably the easiest difference to spot, is the logo patch. 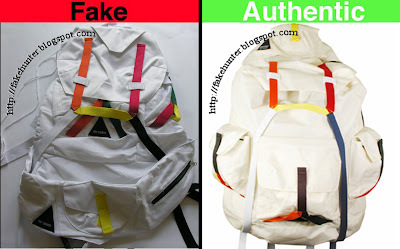 As you can see, the fake bag is missing the Eastpak logo. 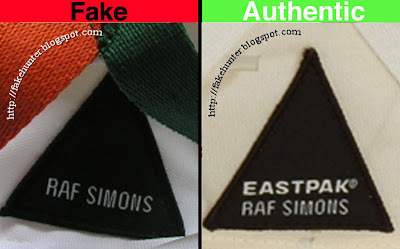 The fake 'Raf Simons' text is also more elongated/taller than the real logo. What a fantastic blog! I've fallen victim to the odd Fomme fes Farfons and Fiktor & Polf on eBay, so it's great to see someone making noise. 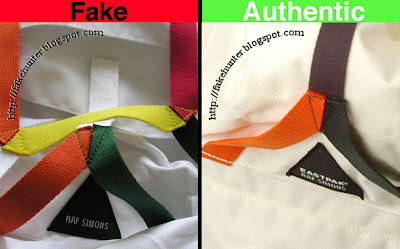 One of the more recent tactics being used is labeling the garment as second-hand, thus creating an aura of authenticity. One eBay store in HK pretty much labels all their stock as 'used' now. The crap is neither used nor authentic.